In the Pacific Southwest (PSW), monsoon season continues to challenge growers as they complete 6th cutting Alfalfa harvest. Export quality continues to be somewhat limited as a result. Cutting is finished, and about 85% of the baling is done so far with the rest expected to be done by the end of the week. A large storm rolled through Utah this week, bringing cool weather, unexpected rain, and flash flooding in some areas of the state. This slowed 4th cutting Alfalfa harvest, and growers only were able to make minimal progress. New Mexico also experienced some spotty, unpredictable weather this week, producing a wide variance in quality across the 3rd cutting Alfalfa harvest. Over the last few days, growers were able to make good progress given the favorable weather window. About 75% of the Alfalfa is cut, and about 55% is baled up to this point. Fourth cutting is expected to begin in the next few weeks. 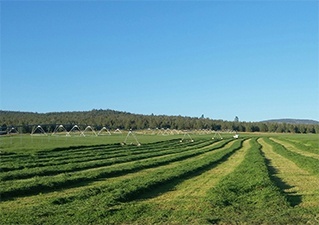 In the Pacific Northwest (PNW), growers in Oregon are continuing tofind good weather windows to wrap up 3rd cutting Alfalfa Harvest. Cutting is about 95% complete, with nearly all of that baled. Quality continues to be good. Some rain is expected in the next couple of days, with clear skies to follow. Washington 4th cutting Alfalfa harvest is about 70% complete. Progress has been slowed in the last week due to low temperatures, however the quality continues to be very good.About 50%of the cutting is baled. The 2nd cutting Timothyharvest in Washington finished up a bit slower than expected, due also to the lower temperatures and intermittent showers. In the Kittitas Valley, all of the harvest has been cut and baled. In the Columbia Basin, 98% of the harvest has been cut and 95% has been baled. Growers are expected to be done baling by the end of the week.